‘Leaked’ Spotify numbers emerged today indicating that the streaming service has just hit 37 million subscribers, which puts more clear water between it and and second placed Apple Music, despite the latter’s recent growth. It also means that Spotify is now nearly 10 times bigger than Tidal and probably Deezer (which hasn’t reported numbers since its France Telecom bundle partnership ended). It is beginning to look suspiciously like a 2 horse race. But there is a more important story here: Spotify’s accelerated growth in Q2 2016 was driven by widespread use of its $0.99 for 3 months promotional offer. Which itself comes on the back of similar offers having supercharged Spotify’s subscriber growth for the last 18 months or so. In short, 9.99 needs to stop being 9.99 in order to appeal to consumers. Which is another way of saying that 9.99 just isn’t a mainstream price point. As the IFPI’s 2015 numbers revealed, the average label revenue per music subscriber fell globally from $3.16 in 2014 to $2.80 in 2015, with price discounting a key factor. According to Music Business Worldwide, 4 million of Spotify’s newly acquired 7 million subscribers were on promotional offers and around 1.5 million of those are expected to churn out when their promotional period ends. That might sound high but it actually represents a 79% conversion ratio, which is a stellar rate by anyone’s standards. Meanwhile Spotify’s total user base is 100 million which means the free-to-paid ratio is 37%. So price promos are converting at more than double the rate of freemium. Does this mean the end of freemium? 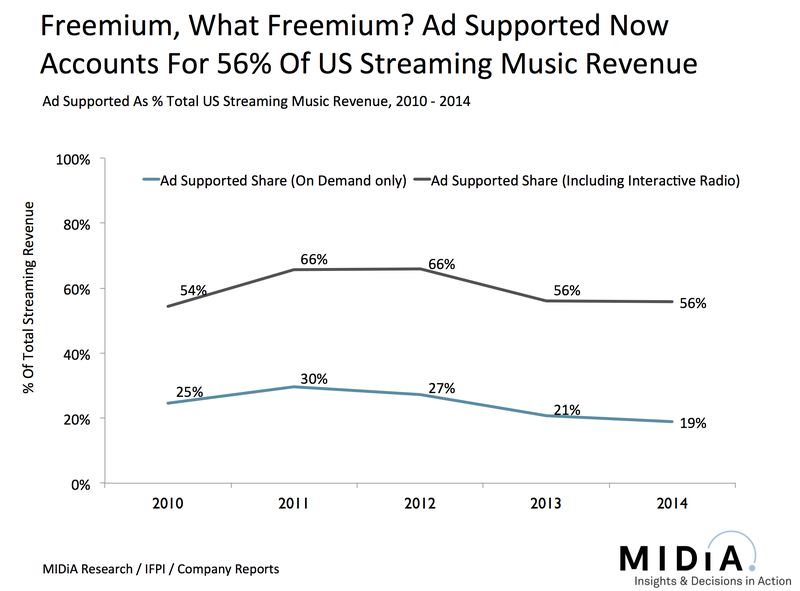 Freemium proved highly valuable to Spotify in its earlier years and continues to be an important entry strategy for new markets. But last year record label execs started to observe that free just wasn’t converting at the same rate it once did in mature markets like the US. This was because most of the likely subscribers had already been converted and so the majority remaining were freeloaders who were never going to pay, and warm prospects who just couldn’t bring themselves to pay 9.99. This is where price promos come into play. They deliver the impact of mid priced subscriptions, which is enough to to hook those wavering free users. Once they get used to paying the majority tend to stick around when the price goes back up. 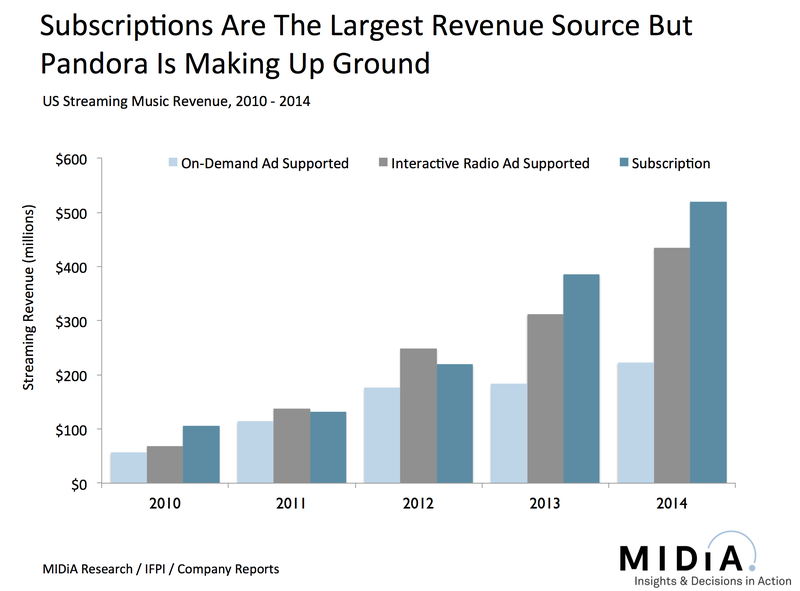 I have long argued that mid priced subscriptions are crucial to driving the streaming market, and the burgeoning success of Spotify’s mid-priced-subscriptions-by-stealth strategy provides a bulging corpus of supporting evidence. In fact, the average spend of Spotify’s 7 million net new subscribers in Q2 2016 was $3.09 a month. The tantalizing question is whether that 1.5 million promo users that are expected to churn out would take a $3.99 product if it was available? As the streaming market becomes increasingly sophisticated, the leading players will have to rely ever more heavily on differentiation strategies. For Tidal and Apple that means urban focused exclusives, for Spotify (for now at least) that means algorithmic, personalized curation and aggressive price discounting. And in Q2 2016 it is Spotify’s strategy that is winning out, resulting in 2.3 million net new subscribers each month compared to 1.4 million for Apple Music and 0.3 million for Tidal. Freemim is dead, long live price promos?